Rob’s Creations is located in the heart of Irving, Texas. We create wonderful works of art out of recycled logs and in ground stumps. Your imagination is the limit. We never harm living trees. All of our material is composed of logs left behind from Texas storms and trees that are cut down and thrown to the curb. Along with countless requests for carvings and special appearances, some of Rob’s recent clients are Irving Cares Food Bank, Lindamood Demolition, Executive Consultants of Plano, City Of Irving as featured in Dallas Morning News, and several pieces of Rob’s Creations were recently donated to the Camp Wisdom camp ground for the Boys Scouts of America. 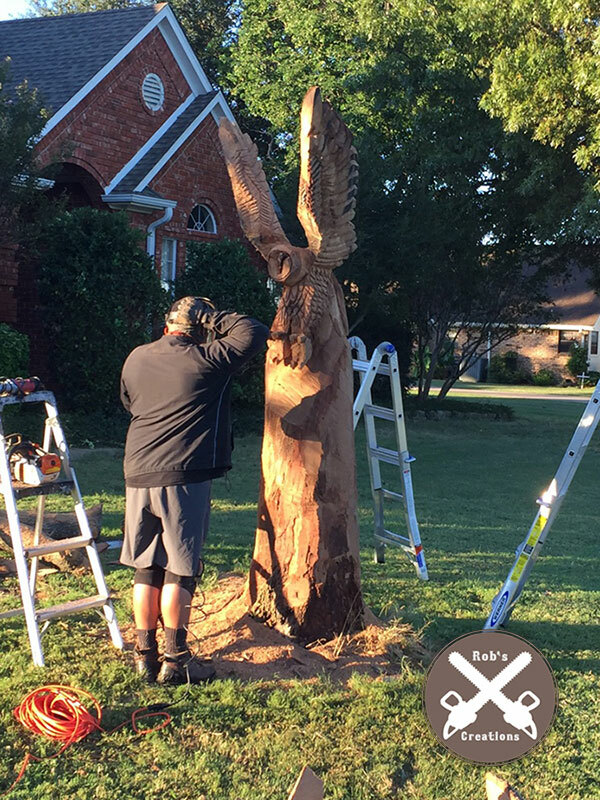 Rob’s Creations has been recognized by the Irving Rambler and his chainsaw carvings have been featured on Azteca Texas News in Dallas/Ft. Worth. Rob’s Creations uses everything from oak wood to red cedar to whatever we can get our hands on. You will never know what you get until it’s finished, because every wood is unique in its grain and that makes it much more beautiful. Dallas, Plano, Irving, Fort Worth, Arlington, Grapevine, Carrollton, McKinney, Denton, Frisco, Southlake, Colleyville, Allen, Rockwall, Duncanville, Rowlett, Burleson, Crowley, Joshua, Mesquite, Balch Springs, Waxahachie, Ennis, Mansfield, Cleburne, Farmers Branch, Keller, Prosper, Aubrey, Decatur, The Colony, Garland, University Park, North Richland Hills, Red Oak, Gun Barrel City, Midlothian, Forest Hill, Ben Brook, Granbury, Corinth, Denton, Wylie, Lewisville, Seagoville, Hillsboro, Bridgeport, Desoto, Royse City, Greenville, Terrell, San Antonio, Atascosa, Bandera, Bexar, Guadalupe, Kendall, Medina, Wilson, Bell, Blanco, Burnet, Comal, Coryell, Crockett, Edwards, Gillespie, Hays, Kendall, Kerr, Kimble, Lampasas, Llano, Mason, McCulloch, Menard, Real, San Saba, Schleicher, Sutton, Travis, Val Verde, Williamson, Canadian and Rogers Oklahoma. Remember to like us on Facebook, follow us on Pinterest and Instagram and check us out for new uploads on the Rob’s Creations YouTube channel. Visit here often as we add new content, and be sure to check the Upcoming Events section on the Home page for special appearances by Rob’s Creations in your area. Sat-Sun: Open for free quotes and inventory pieces.